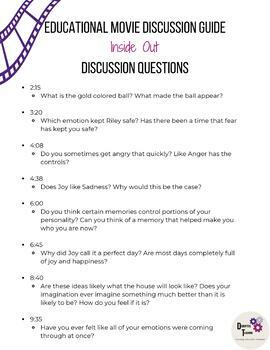 Movie Discussion Guide for the Movie Inside Out ! 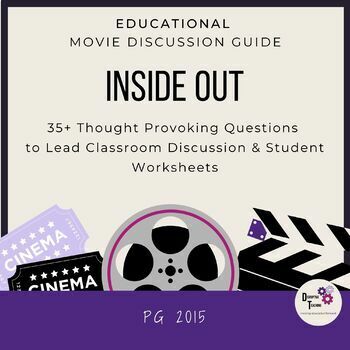 Use movies to teach core concepts and social skills with this Movie Discussion Guide. 40+ thought provoking discussion questions, along with the time stamp for each. No more questions at the end of the video! Keep your students engaged and learning throughout the entire viewing. 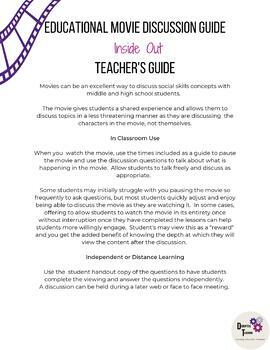 Movies can be an excellent way to discuss social skills concepts with all students. The movie gives students a shared experience and allows them to discuss topics in a less threatening manner as they are discussing the characters in the movie, not themselves. When you watch the movie, use the times below as a guide to pause the movie and use the discussion questions to talk about what is happening in the movie. Allow students to talk freely and discuss as appropriate. Check out my other animated Movie Discussion Guides for Frozen & Big Hero 6.